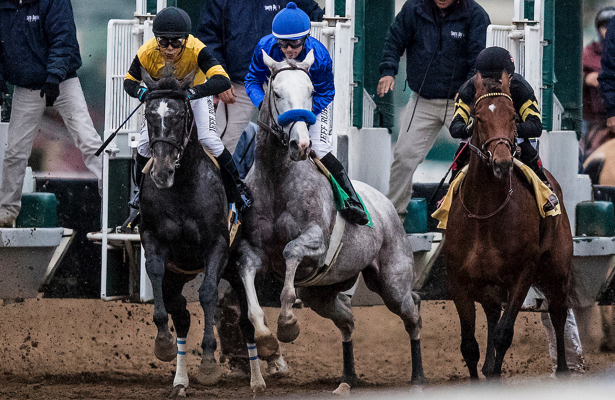 It’s a race that could both lead to — and for at least one contender, lead back to — the 2019 Kentucky Derby trail on Sunday as Santa Anita Park hosts the Grade 2, $200,000 San Vicente Stakes. Run at seven furlongs, the sprint notably served as a springboard for the 2016 campaigns of eventual classic winners Nyquist and Exaggerator, with the talented Kobe’s Back and Lord Nelson also among its recent winners. 1. Synthesis, 6-1 (First Samurai — Keith Desormeaux/Kent Desormeaux — 8: 1-1-4): This one’s a bit of a head-scratcher. Synthesis, who broke his maiden at 1 1/16 miles and ran already around two turns on the Derby trail, last time backed up to six furlongs and finished third, 4 1/4 lengths behind rival Savagery, in allowance company. He offered nothing for the winner that day. There’s a large enough sample size to prove he’s an unlikely winner but is a consistent board-hitter. Use underneath. 2. Coliseum, 6-5 (Tapit — Bob Baffert/Mike Smith — 2: 1-0-0): The experiment continues here. A flashy maiden winner last November at Del Mar, Coliseum lost all chance of winning his stakes debut in the Sham Stakes (G3) at the break. The Godolphin runner has continued to struggle leaving the gate in morning works but remains ultra fast once he gets going. This cut back to seven furlongs comes with a few equipment changes and a new rider in Smith. We’ll see if he puts it together. Vulnerable favorite. 3. Dessman, 5-2 (Union Rags — Bob Baffert/Flavien Prat — 1: 1-0-0): The “other” Baffert in this field, the Florida-bred purchased for $750,000 blasted foes in his debut, winning by 7 1/2 lengths on Jan. 19. The speed figures didn’t come back particularly strong, and he galloped out well behind the emerging filly Flor De La Mar when they breezed in company on Jan. 13. The thinking here is this distance is well within Dessman’s scope, but that he’ll only be aiming for a piece of it. Use underneath. 4. Sparky Ville, 4-1 (Candy Ride — Jeff Bonde/Joel Rosario— 7: 2-1-2): This gelding has butted heads already with California’s best Derby hopefuls, looking a cut below Game Winner, Instagrand and others. Here, he doesn’t catch a big horse, and after seven races as a juvenile enters off a bit of a freshening with his last race Dec. 28 on the turf. The one-paced type could be able to clunk up for a piece of it. Toss. 5. Savagery, 4-1 (Bellamy Road — Peter Miller/Herbert Figueroa — 8: 2-2-0): After routing twice when fifth in the Los Alamitos Futurity (G1) and seventh in the Sham Stakes (G3), this Rockingham Ranch runner impressed Jan. 12 when going back around one turn. He set himself up for a better graded stakes shot with a 3 1/2-length victory in the aforementioned allowance. Plenty experienced, Savagery should set the pace here and might take them all the way. Win contender. Summary: Simply, if you believe in Coliseum, sit this one out at the expected price and risk that he won’t have time to make up ground in the event of a missed break. If you’re betting against, still wait until the tote board gets moving to consider a play. Savagery looks like the most logical alternative. If the show plunge is on for the favorite, that opens up more possibilities.